I have been seeing slab pies around the internet quite a bit this fall. I can't say I've ever eaten or made one before. My brother-in-law, Steve, had a birthday last week and was asking for a pumpkin pie instead of a cake. My mother-in-law has been crazy busy with other things so she was planning to buy him pies for his birthday dinner. Since I have been wanting to make a slab pie I took this opportunity to create one. I prefer not to use canned sweetened condensed or evaporated milk in my pumpkin pies if I can avoid it. I also wanted to make a pie with brown sugar. It is an unusual ingredient, but I think it adds so much to a pumpkin pie. I found no recipe for a slab pie that fit my criteria. That's okay. 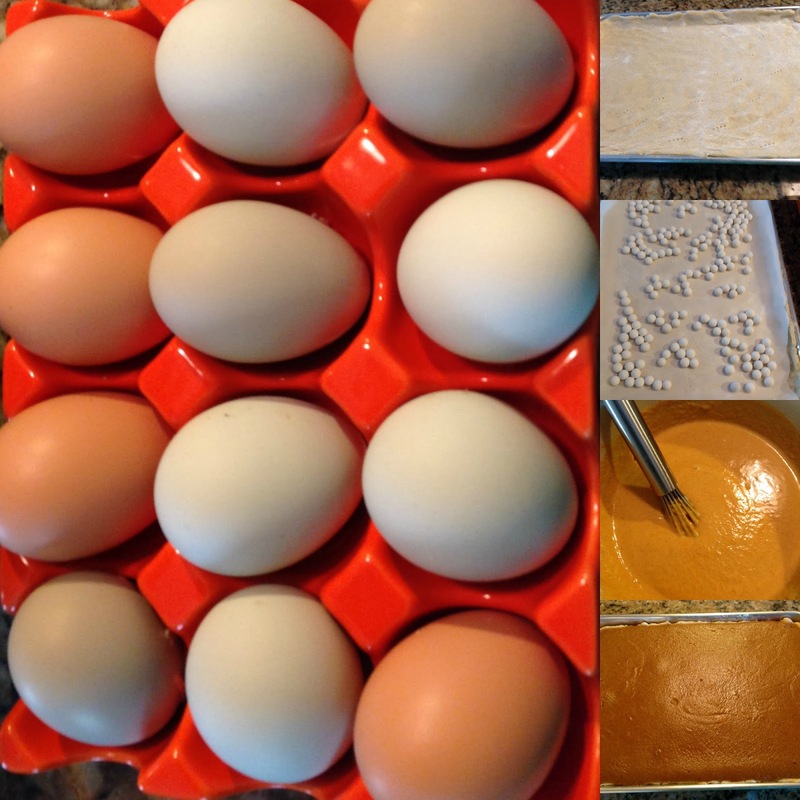 I have fun creating new recipes and Carlee can share them on her blog. That's a win win for us and a very special birthday treat for Steve. This recipe made 1 slab pie plus enough for a small pie for the birthday boy. Carlee's two cents: This pie was good! Everyone loved the pie, the honeyed pecans, the maple whipped cream and the little pie crust leaf garnish. They were very impressed that MiMi went through all that work and brought it all to the party. 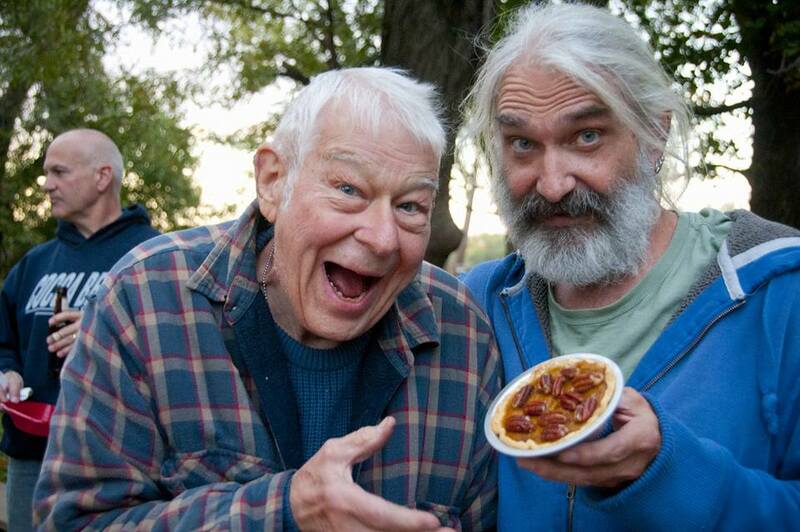 Uncle Steve said it tasted like a bit of fall. It certainly got everyone's attention. I won't be surprised if another one is requested for Thanksgiving! I love how you can cut slices as big or small as you'd like (so there is room on your plate to try more things!) Plus, there are center pieces for those who like pie, but leave the rim of crust behind! MiMi really just wanted to show off her fresh eggs from her back yard! In a medium bowl, whisk together the flour, sugar and salt. Set aside. In a measuring cup or small bowl, combine water and apple cider vinegar. Set aside. Toss the butter into the flour mixture to gently coat it. Then use a pastry blender to cut the butter into the flour. You should have various sized pieces of butter, ranging from sandy patches to pea sized hunks, with some larger bits as well. Add about half of the ice water mixture and stir lightly with a fork until the flour is evenly moistened and the dough begins to come together into a ball. If the dough seems dry, add a little more ice water, 1 to 2 T at at time. Roll out on a lightly floured silicon pad to about a 15x17" rectangle. Place in a 10x15" rimmed baking sheet pan. Place baking sheet in the refrigerator for another half hour. Dock the crust dough (prick it with a fork), then cover with a sheet of parchment paper and pie weights. Bake for 10 minutes on the bottom shelf of your oven. Brush with slightly beaten egg white and a pinch of fine sea salt. This should help keep it from getting soggy. Bake an additional five minutes. Pour filling into the par baked pie crust and bake for 50 minutes to one hour. The filling should be just slightly wiggly when shaken. Let it cool completely then wrap and refrigerate until read to serve. I've never even heard of slab pie, but I'm willing to give it a go! Those pecans on top looked great too. I hadn't either until recently. It is a fun way to have a pie for a party! I made an apple version recently too that I can't wait to share. The honeyed pecans were so good. I could have eaten them all by myself! Thanks for stopping by! Huh, a slab pie! This is genius - a good way to make sure everyone gets a piece, and the people who aren't a fan of crust (weirdos), can have the pieces in the middle! Great idea! I know, I love the crust too. There are always bits of crust left on people plate though (not on my husband's though, I steal those!) This makes plenty to share and gives everybody a chance to have what they like! 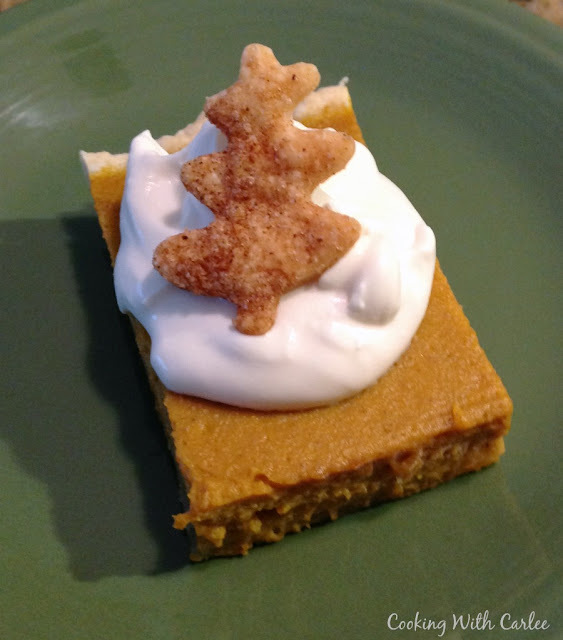 Love the brown sugar with pumpkin pie idea. And the slab pie idea, too. Thanks for sharing on Creative K Kids Tasty Tuesdays. I hope you will join us again next week. Thank you, this was a real winner! Everyone was raving about it! It is such a fun way to have pie! I hope you enjoy it! I love pumpkin pie and this looks like a different version. It is on my to do list! Thanks! It a great one, especially for groups. I hope you love it! 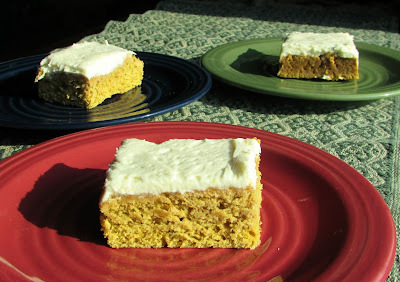 Never heard of a slab pie before,topped with maple whipped cream and honey pacans... mmm sounds good will have to give these recipes a go... pinned! I hope you make them. They are so delicious together. Thanks so much for stopping by! Pumpkin pie is my favorite, I love this new variation. 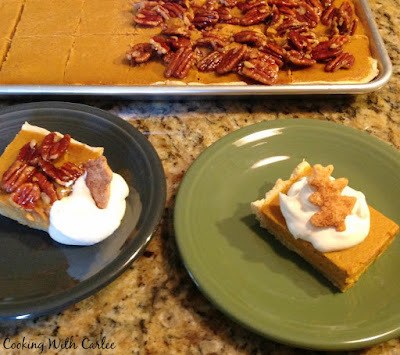 I have made other slab pies but never thought of doing it with pumpkin! Aren't slab pies fun? I hope you love this version! Oooh, I could really go for a peach slab pie! I've never heard of a slab pie but I'm not surprised that you've seen it trending! It's an easier, larger way of having pie! Stopping by from the Country Fair Blog Party! They are fun to make and fun to eat! Thanks so much for hosting! I am all about finding new spins for some of our more traditional favorites, and this sounds like a great twist to the old stand-by pumpkin pie. Thanks for sharing it with us at Throwback Thursday #12! Thank you! This may be my new favorite way to have pumpkin pie! I think I might be obsessed with the little maple leaf on top! Thank you for linking up with us at the Tips and Tricks Link Party! I cannot wait to see you again this week! Isn't that the cutest?! Thanks for hosting, see you next week! This looks like a great slab pie! Thanks so much for sharing with Full Plate Thursday and hope you have a great week. 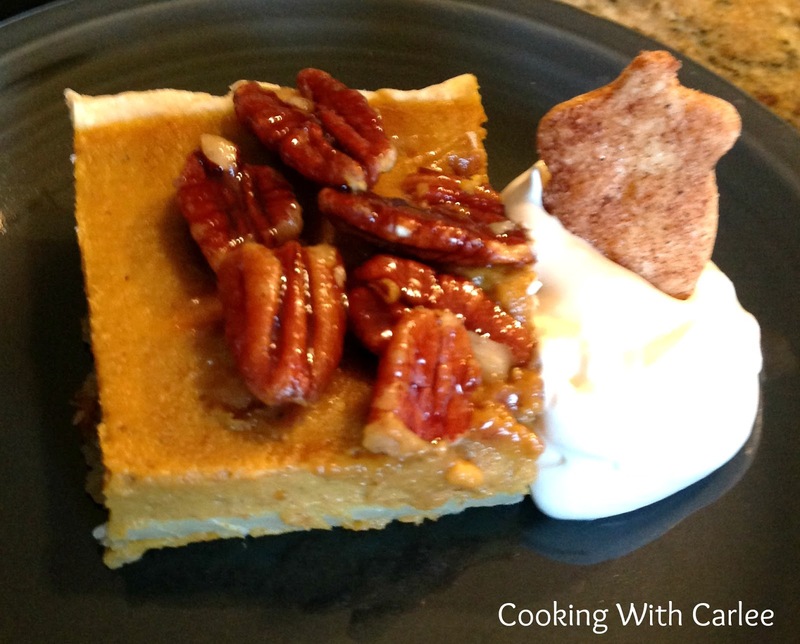 Sounds amazing- my family loves pumpkin pie! We do too, Jessy! This is a great way to serve a crowd! I can't wait to make this. It looks delicious! I've never made a slab pie, but it sure looks delicious! Thank you! I have made a few this fall and have really been enjoying them! I'm another one that hadn't heard of a slab pie but I love it! Thanks so much for sharing with us at Share The Wealth Sunday! This is the perfect time of year to give one a whirl! Thanks for hosting! Well you slab pie seems to be a new idea to many as well as for me. Sounds like a great idea. Thank you for sharing with the Clever Chicks Blog Hop! I hope you’ll join us again next week! It is a fun way to serve a crowd! Thanks so much for hosting, see you next week! Going in my recipe box right now! This sounds fantastic! I too am a fan of brown sugar and love to use it instead of white sugar when I can. Thank you for coming back to the Country Fair Blog Party! Always enjoy reading what you post. Thank you! Brown sugar adds so much more depth of flavor! I love the Country Fair Blog Party. It is always so hard to pick what posts to bring though! Thanks for hosting! Really looks good! Thanks for sharing on the Lazy Gastronome's What's for Dinner linky party! It was a hit for sure! Thanks so much for hosting! You should totally give it a try! It is so easy and perfect for a crowd! I'm pinning this for later! I love slab pies! Thanks for sharing on the Pi Day Link Up Party! I hope you love it! Thanks, Val! You should do it!! They are so much fun and perfect for a potluck!